JEGS Cat-Back Systems are designed to produce more horsepower at an affordable price. 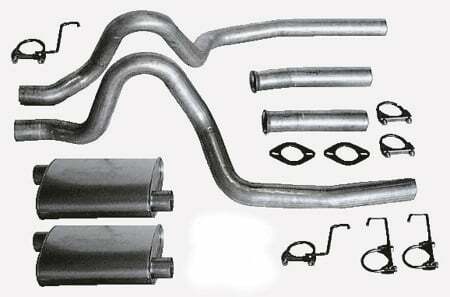 We begin with fully aluminized 16-gauge tubing then use a proven mandrel bending process to form a smooth flowing system that is free of any "ripples" or "kinks", which restrict and slow exhaust flow. Most cat-back systems include high flow mufflers, for a throaty sound and increased flow while keeping the system emissions legal. Easy bolt-on installation. Does JEGS 30403 fit your vehicle? 30403 is rated 2.0 out of 5 by 1. Rated 2 out of 5 by 600pred from Got the exhaust put on after wrestling it into position. The pipe doesn't extend all the way into the slip fittings so after getting it lined up I had to tack weld it. No way was a clamp going to keep it in place. Then went for a test drive. It is very quiet with the turbo mufflers doesn't drone at all. I do appreciate that. After rechecking all the clamps and hangers I went for another test drive and one of the tailpipe holders fell off somewhere on the road.